If young people today want to attend university, they will have to pay for tuition and borrow to meet living expenses. When they graduate, they face a much more competitive job market. Few careers will offer the job security once characteristic of middle-class employment. Defined benefit schemes have almost disappeared from the private sector, and public sector pensions are to be substantially less generous. Tax rates must rise, partly to pay for the care and medical treatment I will demand as senility advances. The only financial consolation for the next generation is the windfall when we leave them our houses. Most parents want to give their children opportunities to live a life better than their own. But when we act together, we aggressively pursue our own interests at the expense of our children and grandchildren: a bizarre paradox of perverse collective action. It is bizarre. But boring old social justice might be at least as important than spreading wealth between age-groups. The examples Kay uses are telling: he writes about the middle class and about university students. Not everyone will get a ‘windfall’ when their parents die — especially if they sell the house to pay for care. Apparently more than two million of the roughly 11.5 million British pensioners live on only the state pension (up to £137.35 (US$216) a week for single pensioners when they claim means-tested Pension Credit top-ups). That’s less than a third of the average national wage. According to Hargreaves Lansdown the average private sector worker retires with a pension worth no more than £2,145, on top of the £100 they’d get from the state. That would mean an average annual income for pensioners of about £7200 or so. Lots of people are working beyond the age of 65 because they don’t earn enough. Nothing wrong with more graft if you’re healthier and living longer — but it doesn’t exactly support Kay’s image of a nation of smiling pensioners lolling in their gardens. In the meantime, wealth is spread increasingly less equally between income groups. According to poverty.co.uk, on many measures inequality has risen over the last decade. 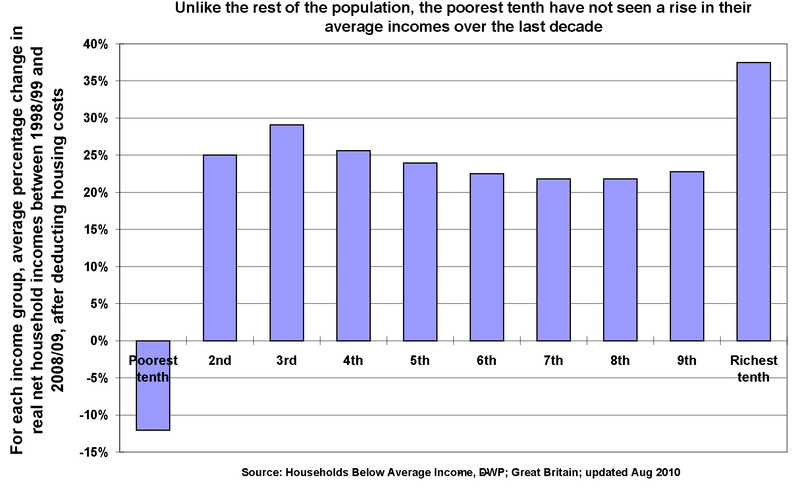 Unlike the rest of the population, the poorest tenth haven’t seen an increase in income over the past 10 years. 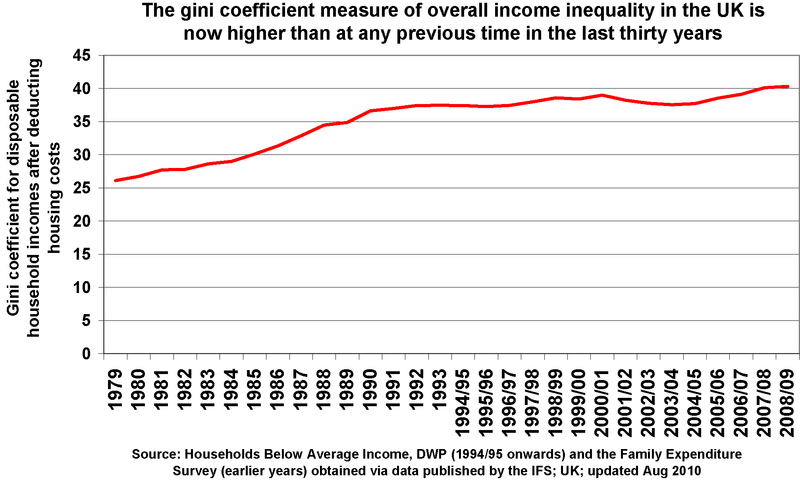 The gini coefficient measure of inequality is now higher (worse) than at any time in the last three decades. 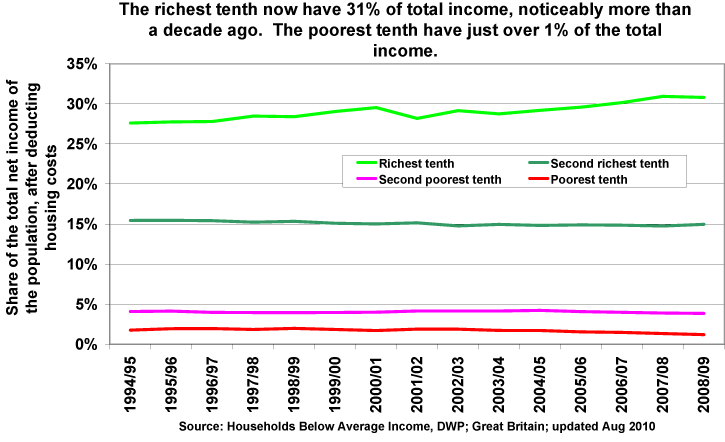 The richest tenth earn 31% of income, much higher than a decade previously, and the poorest tenth have 1% of income. None of this data takes into account the inequality induced by the global economic crisis which began in 2008. 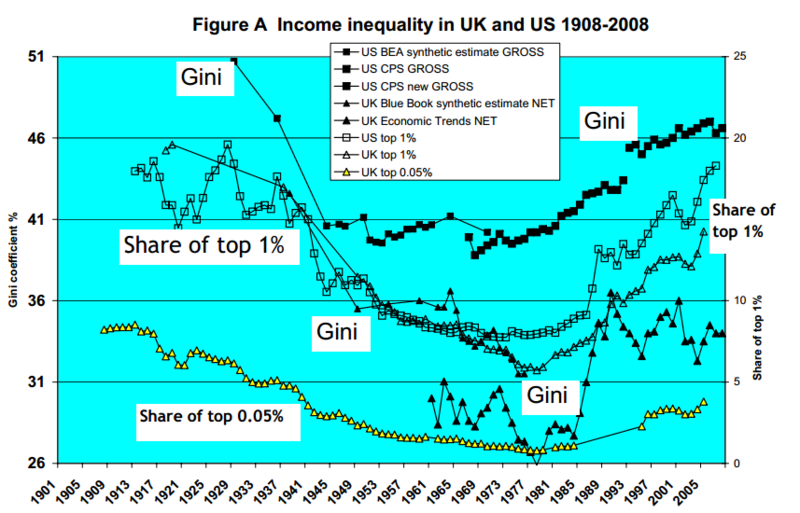 And the following graph, from gini-research.co.uk, shows that inequality rose over many decades in both the US and UK. In both countries, most measures show a fall in inequality and the income share of the richest until about the 1970s, before a flattening out and a rapid increase in inequality from the 1980s onwards. Overall, Kay’s right that many old people had it good for many years — but it was probably a particular class. I was chatting to my taxi driver the other day who said he’d worked as a fitter and welder on ships for 30 years until the work dried up. I was expecting him to tell the cliched story about the decline of secure employment in manufacturing and being forced to take up a dodgy services job, but he said he used to be regularly laid off and had to travel across Europe to find work. He missed his mates, he said, but not the health hazards, particularly the pain of being half-blinded every time a ‘flash’ got round the corner of his welding mask. He’s never had a secure job and he isn’t looking forward to a lavish retirement. There’s no either/or: you can have both intergenerational and social injustice. I suspect that economic inequality is a more deeply-entrenched and meaningful category. Freezing tax allowances for pensioners and lowering the top rate of tax — as George Osborne did in last week’s UK budget — is just one more example of the rich shafting the poor. ← Obama goes out on a limb for slim Jim Kim. It’s no whim.